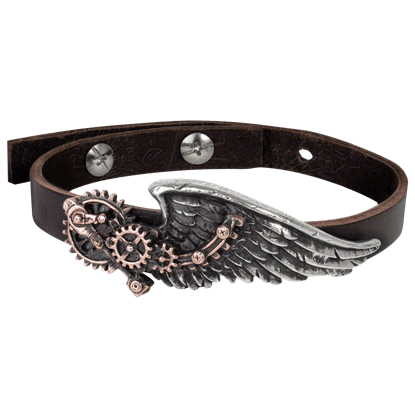 We carry a fantastic array of steampunk jewelry, including fun steampunk bracelets for men and women. Our steampunk bracelets include metal and leather cuffs, steampunk bangles, and even steampunk sleeve garters to suit aristocrats or airship captains. Our steampunk wrist straps and Neo-Victorian bracelets show off retro-futuristic decorations like skeleton keys, cogwheels, mechanical devices, and more. Other designs look as though they have been taken straight from Twenty-Thousand Leagues Under the Sea, displaying old-fashioned anchors and octopuses. Still other pieces would not look out of place in actual Victorian England, crafted from fine lace, beads, and ruffles. Take a moment to browse, and you are sure to discover a unique steampunk accessory for your look! 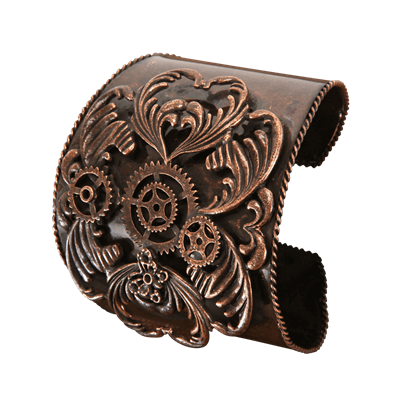 There will be no disputing your Steampunk style whenever you adorn yourself with accessories like this Antique Copper Steampunk Cuff. Elegant and ornate, this cuff can be worn anywhere on the arm to accent many different looks. The primary power source behind the GMT system, providing tension to the receiving transposition chamber. 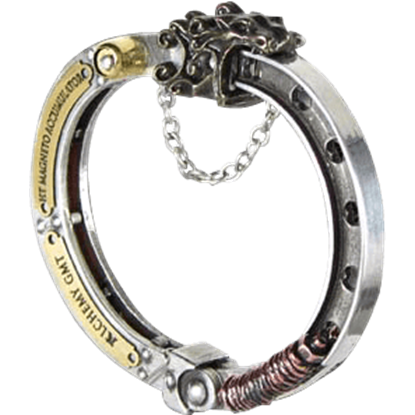 The Galvanic Magneto Inducer Cuff-Bracelet is a one-size adjustable-setting hinged cuff fit for any steampunk setting. Based on an early scientific instrument from the steampunk Age of Reason, the Portative Spectrostat Bracelet sports a condensed version of a device intended for controlling moonlight wavelength emulations fastened to a leather band. 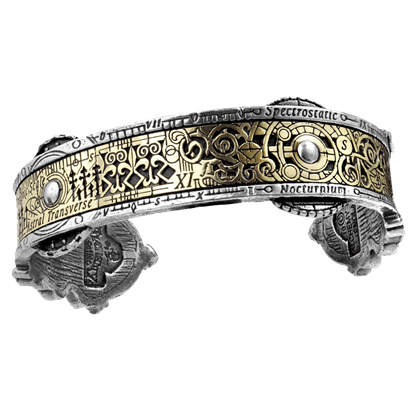 The Spectrostatic Nocturnium Bracelet represents an early scientific instrumental band for controlling moonlight wavelength emulations with antiqued pewter and solid brass. The Spectrostatic Nocturnium bracelet is hand cast in pewter. Prepare for a fantastic journey into the intriguing realm of the Neo-Victorian Era. 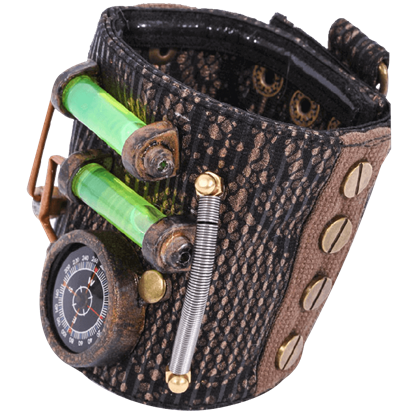 The Steampunk Compass Wristband belongs to the clever eccentric who realizes that the proper tools and contraptions must always be within reach. 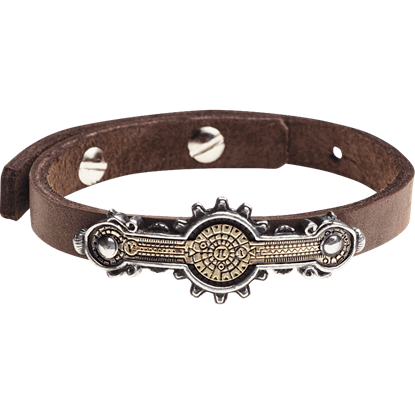 Adding this Steampunk Leather and Gears Bracelet to your Steampunk outfit is a fantastic way to forge an unforgettable look. 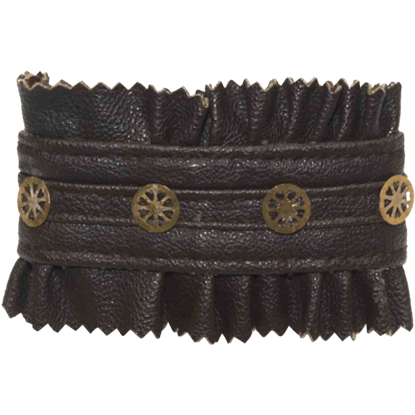 With its ruffled leather and gear decorations, this bracelet will rarely go unnoticed. There is an old phrase that states simply that less is more. Well, in Steampunk style, this is rarely true. One look at this Steampunk Multi-Band Bracelet will tell you that when done right, more is always more impressive than less. The Black Baron Wingstrap Bracelet is a fine accent, inspired by a gift from the famed hero of a bygone era of unexplored skies and roaring adventure. It is also an accent that any lady can sport as a part of her steampunk ensemble!